As the Bahrain This Week team walked into the compound at Saar Avenue 35, we were welcomed by loud barks of dogs, accompanied by chirping of birds and the chatter of a happy monkey. This is the shelter ran by Tony Waters, better known to the world outside as The Dog Father. Rescued under different circumstances, over 450 inhabitants have found a new life here thanks to Tony. BTW caught up with Tony, who shares with us the story of his life that is dedicated to the well being of abused animals. He is known across the Kingdom for the rescue operations he carries out for the rehabilitation of injured and abused animals. With over 30 animals with only 3 legs, a kitten with no back legs and numerous other animals that are either blind, deaf or old, the center works nothing but miracles, assuring happy survival for these otherwise ‘dumped at the roadside’ animals. “If I statistically compare my rescue missions of the past with the present, sure the numbers have come down. The major reason is the lack of amenities I have here to properly take care of them. Otherwise I can never let these animals end up in wrong hands,” he shares his concerns with our team. “The cost that comes to run this place is BD5000 per month which includes paying the rent, bills, and the salary for my employees and the food and water expenses of the animals here. And all I’ve got to rely on is charity. But…,” he pauses, “this place means everything to me. I surrendered all I had achieved in my life for them. And I never get old and never get bored.” Tony adds, expressing his never ending love for the center he runs. Tony and his dogs are highly popular among the school students in Bahrain. Visits to his rescue centre have helped raise awareness among the young generation to be kind towards animals. He doesn’t forget to thank the support he has been receiving from the Cat Society and Delmon Kennels. “They have helped with a lot, including finding the right homes for the young ones,” he says. 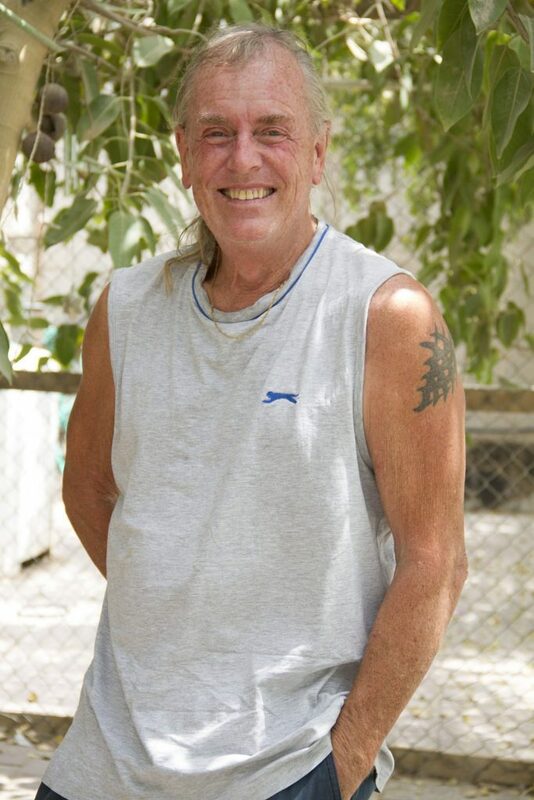 Tony has been in Bahrain since over 30 years and has not left this nation in the last 20 years. As he awaits his Bahraini passport, there are several other issues that have given this man sleepless nights. “Being with these animals and taking care of them is not an easy task and sometimes it is really stressful,” he admits. Tony’s animal rehabilitation centre is running completely with the aid of a generator since last November. Unfortunately he can’t use air conditioners all the time on the strength of the generator. This is a grave problem, what with the advent of the harsh summer; few of the animals have already died. While he discusses these serious issues with us, it is hard to miss his eyes tearing up for a second there. But putting on a brave face, he smiles and says, “I have written to the honorable royal family and the ministers and have visited them in person many times. It’s my sincere hope that there will be help coming from the Government for these poor animals here. It is true that I am in the middle of several pressing problems but I like to think positive,” Tony ends the conversation on an optimistic note.